If you’d like to write about the acts you see and have it published in The Noise, New England’s longest running music magazine, email tmax@thenoise-boston.com for the guidelines. Jamaica Plain Farmers Market/ Watertown Farmers Market/ etc. How does he do it? What are his secret energetic ingredients? Who’s his agent? 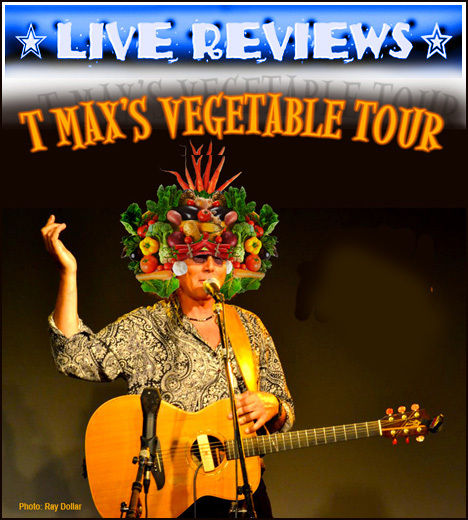 In a never-ending quest to be amongst the “people,” T Max has turned into a modern day Woody Guthrie, a troubadour roaming the land to bring his music, his whimsy, and artistic inspiration to the area’s local farmer’s markets. Starting in Jamaica Plain, he has already touched down in Gloucester, Medford, Norwood, Waltham, Newton, Chelmsford, Tewksbury, Stoneham, Haverhill, and Watertown, and will continue onto South Boston, Revere, Salem, Harvard, Melrose, Ipswich, Dorchester, Everett, Topsfield, and Lynn before the harvests set in. That’s a feast of entertainment to swallow. Killer Cortez, a duo of drums and guitar featuring Socrates Cruz. The music is upbeat and trippy, creating a cool ambiance. As the band plays, I reconnect with an old college friend who just relocated to Boston. Inspired by the band on stage, she says that one of the things she really likes about Boston is how easy it is to see great bands any night of the week and constantly be exposed to great new music. She is absolutely right. Next up is Nomad Stones, a hard rocking trio featuring Adam McGrath, formerly of Cave In, on guitar and vocals. The band lets loose with an arsenal loaded with heavy rock ’n’ roll and bombastic guitar solos. It’s unapologetically loud and in your face. Even standing towards the back of the room, you can feel the music coarse through your body. The energy of the sonic bombardment is contagious. Their up-tempo stuff remind me of one of my all time favorite bands that used to play in town called Cancer to the Stars. Two thumbs up for that. Last spring, I attended a Bent Knee concert in Lowell and was immediately impressed with one of the opening acts – Forget, Forget (from Portland, Maine). Since they trek down to the Boston area only several times a year, I’ve been on the lookout for their return. Guitarist-vocalist Tyler DeVos and keyboardist-vocalist Patia Maule are an indie synth-pop duo that click on all counts – extremely catchy tunes, lovely duel vocals, subtle washes of keyboards over delicate guitar filigrees. Tonight, they are second on a four-band bill, following a bouncy sextet called Auva, a surfy psychedelic dream-pop act with big guitars, keys, double percussion, and multiple vocalists. On one tune, the main solo is all of them whistling the melody – very clever. I find them intriguing and they come across like a cool blast of young, fresh thinking. If you’d like to write about the acts you see and have it published in The Noise, email tmax@thenoise-boston.com for the guidelines.